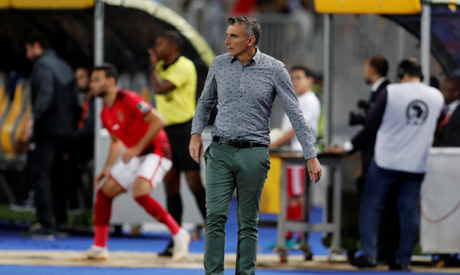 Ahly coach Patrice Carteron said on Wednesday his team is ready to face Tunisia's Esperance in Friday's African Champions League final second-leg despite the absence of some key players. The Red Devils will be looking to protect a 3-1 first-leg advantage when they face their North African rivals in Rades but scoring a crucial away goal could prove more difficult without influential striker Walid Azaro. The Moroccan will miss the second leg after he was hit with a two-game suspension by African governing body CAF for ripping off his shirt to deceive the referee into thinking that he was tugged in the build-up to a second-half penalty he won. Ahly will also have to do without veteran right-back Ahmed Fathi, who picked up an injury in the first leg. "We are ready for the match and we have a specific goal is to return from Tunisia with the trophy to make the fans happy," Ahly's French boss Carteron was quoted as saying by local media on Wednesday. "We have solutions to overcome the absences that hit the team; Mohamed Hani can take the place of Ahmed Fathi," he added, without explaining who could replace Azaro upfront. Esperance will also miss two key players in Chamseddine Dhaouadi and Franck Kom, who picked up second yellow cards in the first leg.